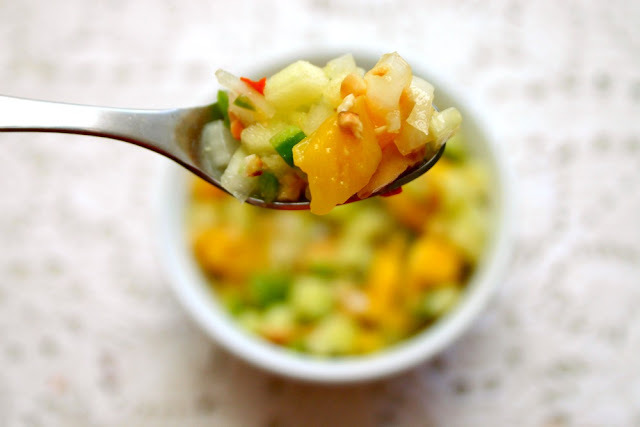 Hot summer days are upon us and to combat the heat, I've been making this cold and refreshing mango, apple and cucumber salsa to have on hand. I've eaten this with salmon, salads, enjoyed it with corn chips and as a taco topping over grilled meats. It just adds a nice zing and crunch to every bite. The flavors will require several hours to come together so you'll need to plan ahead and factor in some refrigerator time. Putting it together is a cinch though and as long as you have decent knife skills, you'll be done in no time at all. Yields about 3 to 4 cups. Prepare all the salsa ingredients and set aside. Mix the dressing ingredients together then pour over the salsa ingredients. 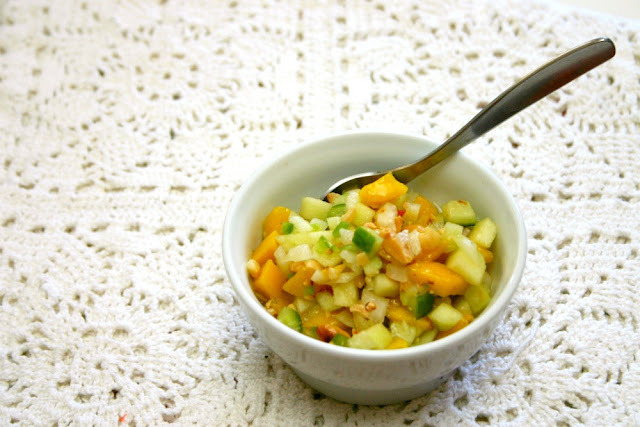 Toss well, cover and refrigerate at least 4 hours or overnight. Serve chilled. 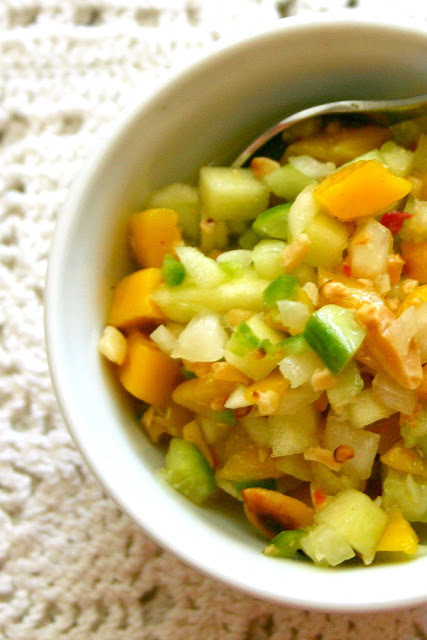 I used Asian mangoes for this recipe. 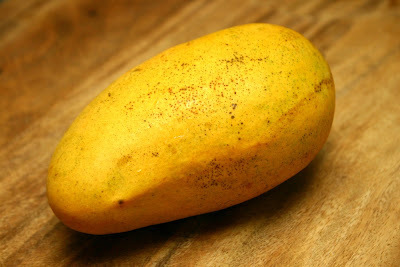 This one from the Philippines has yellow skin when ripened. To prepare the mango, I cut down each side of the mango (leaving the seed for me to munch on later.) Then I make deep slits in the flesh, vertically and horizontally. Finally, I run my knife between the skin and flesh and pop all the chunks out. This method beats having to remove the skin which I hate doing. 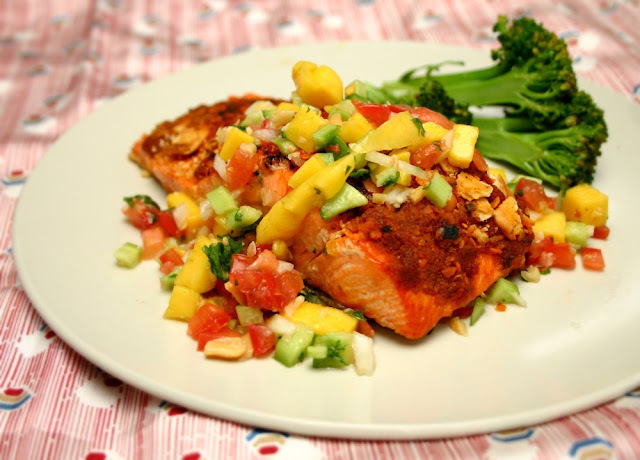 I had the salsa with some Thai style cracker crusted salmon one night. I had also added tomatoes to my salsa which tasted great as well.